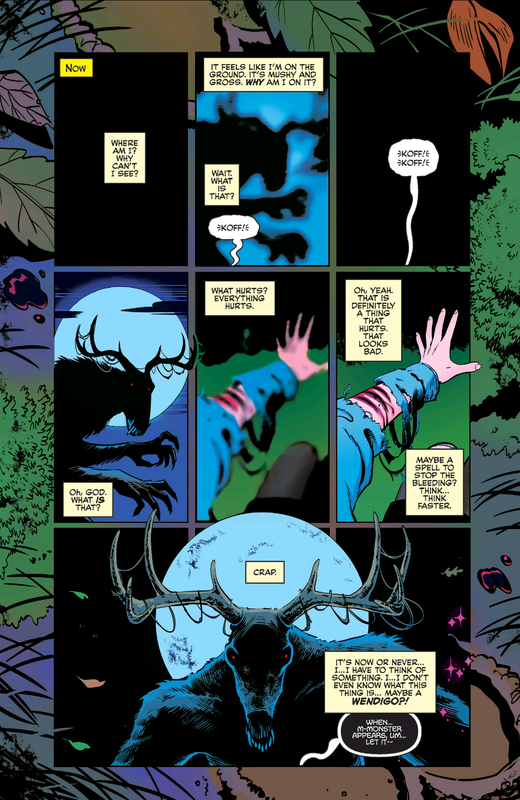 The opening page’s layout, with the panels nested among environmental details and the wendigo looming so large it breaks free of the grid, puts me in mind of Swamp Thing and horror comics. But this isn’t really that. In TV terms, it’s more 1996 than 2018 – as made clear by Thompson’s pitch-perfect Salem banter. I can practically hear Nick Bakay’s deadpan on these lines. 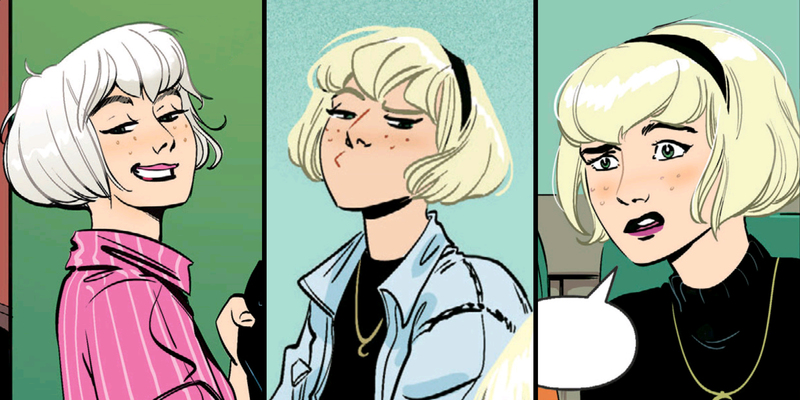 I like Fish’s design for Sabrina, mixing and updating various influences – but the best bit is how expressive she’s drawn. 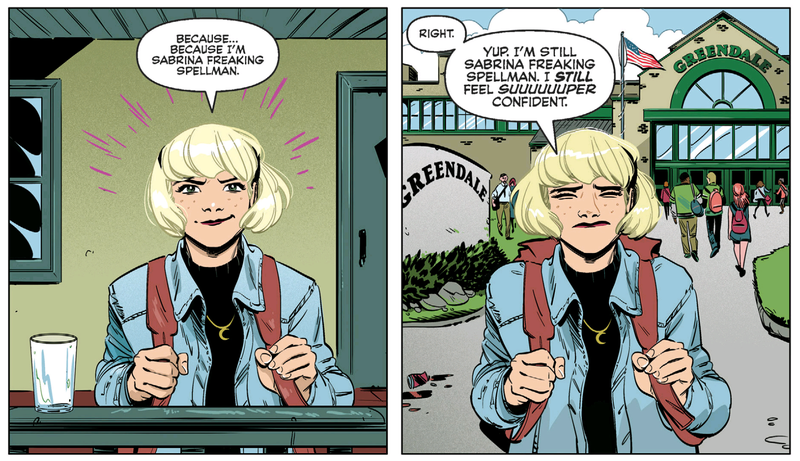 The cartoony elasticity of Sabrina’s facial expressions really helps sell jokes and moments of teen drama. Speaking of updated looks… I’m a big fan of this Zelda and Hilda. There’s a lot of the Netflix incarnations in there, but they still feel like distinct characters in their own rights. 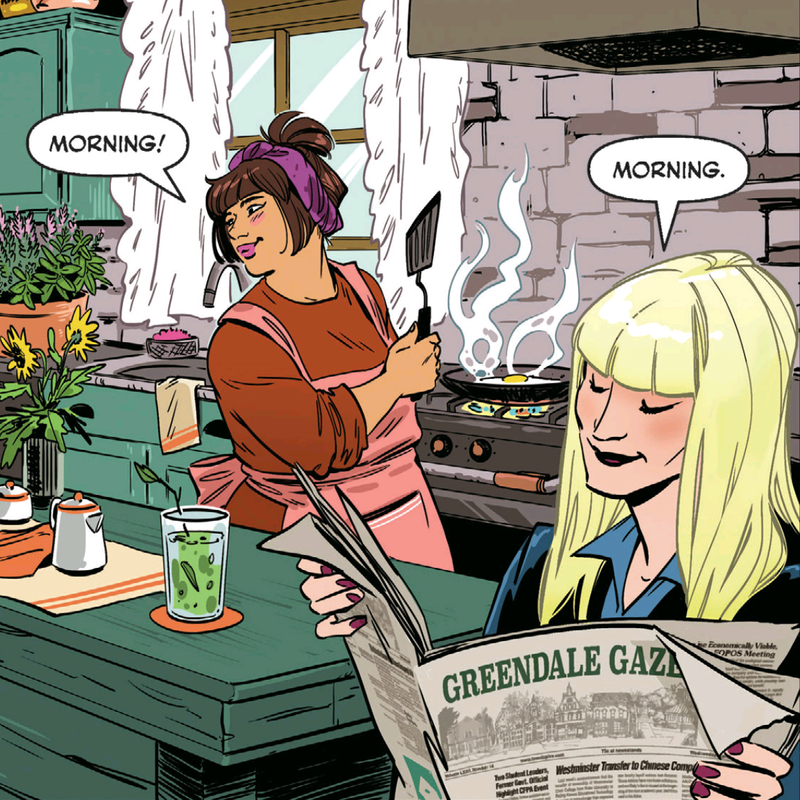 We don’t get much time to really dive into their personalities, but there’s some brilliant efficiency at work in the dialogue here: the small difference between their “Morning”s tells you everything you need to know about each Aunt in a single piece of punctation. There’s a similar thing at work with Harvey. 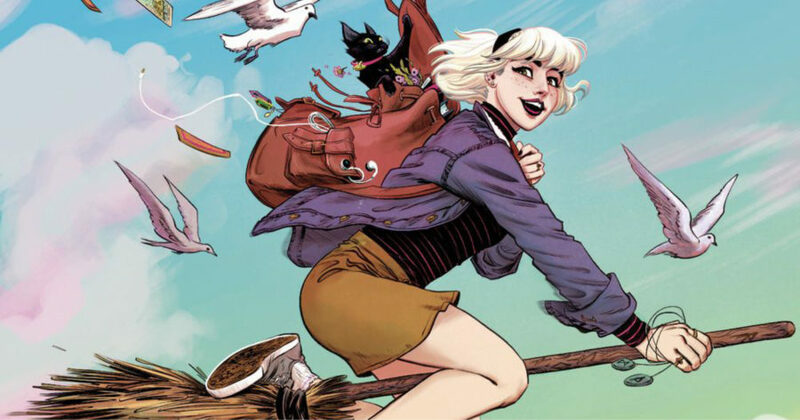 We get a single page of meet-cute with Sabrina, but read the art closely and you’ll find little moments throughout that develop their relationship: Harvey jealously eyeing ‘Brina and Ren, the two waving from their separate groups. Another great little background detail: these lads absolutely losing it at someone falling over. They’re too small for you to see faces, but the body language expresses the moment perfectly. We all know these boys. 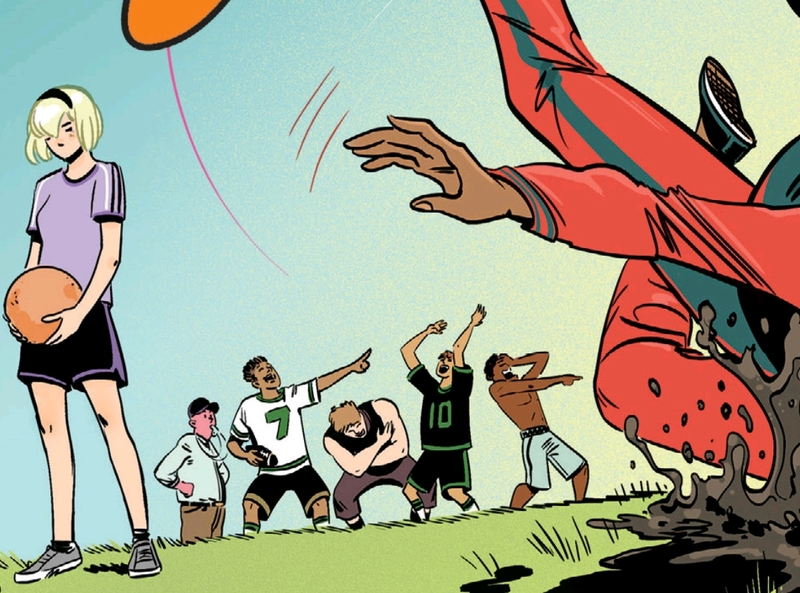 This issue goes a lot heavier on the high-school than the horror, but there are a few moment that suggest how the latter might come out in future issues. 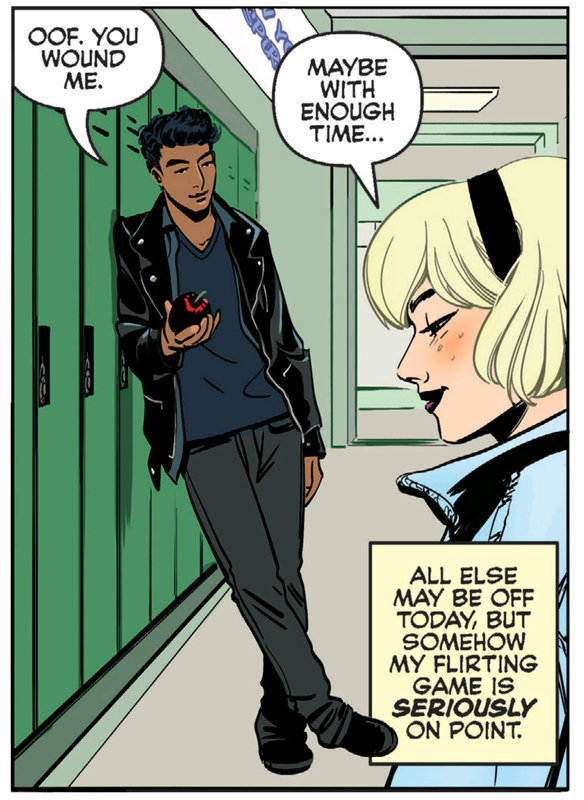 These lines of dialogue definitely feel like a statement of intent, pointing to a Buffy-style ‘high school is hell’ approach. Look at the way that magic is presented, too. 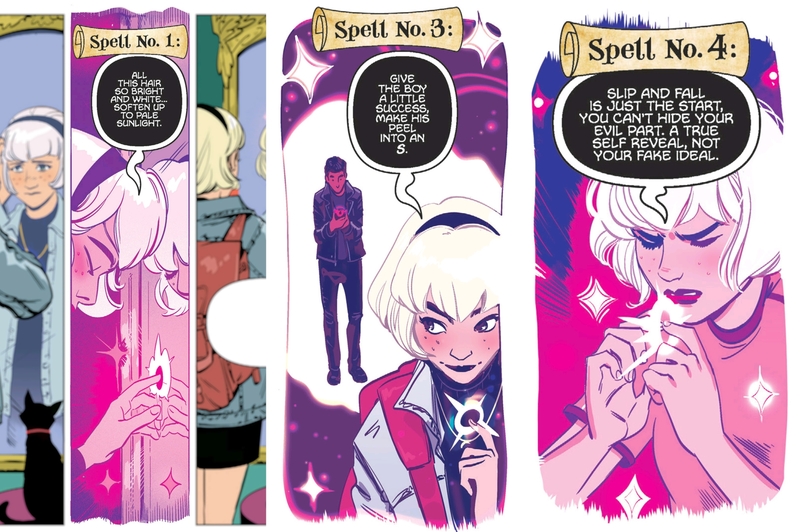 The panels switch colour palette and lose the angular borders – but each spell is also numbered. It creates a sort of implied countdown, leaving you waiting for the other shoe to drop. 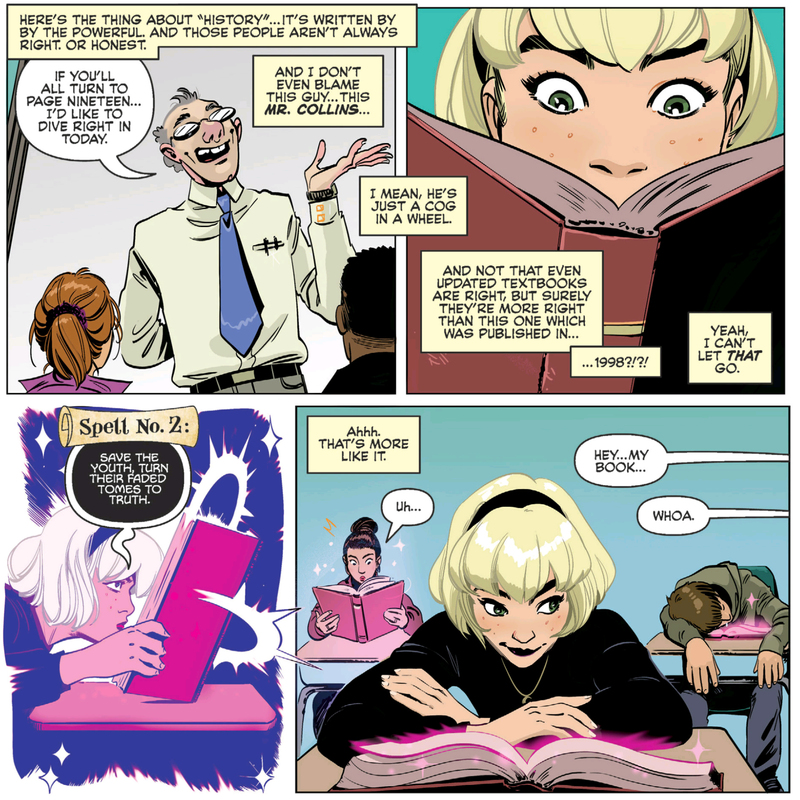 It’s also pretty great that one of the spells Sabrina does is rewriting the textbooks, presumably because they’re erasing some ugly bit of American history. Witchcraft at its most woke. Can’t quite get my head around this lettering decision, though. Putting Ren’s feet in front of the narrative caption places it in the world – which can be an effective technique. But here it just messes up the sense of perspective. …Is Ren actually a tiny man stood in the foreground? The (to steal a cinematic term) ‘match cut’ is a surprisingly rare technique in comics, but it can be really effective. Like these panels, emphasising the contrast between Sabrina before and after. 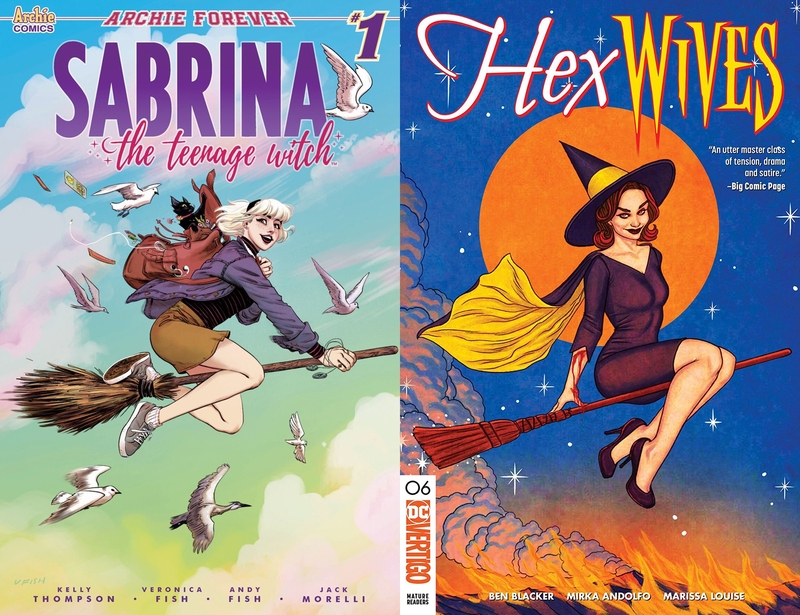 And to finish, a weird little coincidence I discovered when buying this issue on Comixology: there are two comics out the same day with matching covers – Sabrina #1 and Jenny Frisson’s cover for the final issue of Hex Wives. Is it coincidence… or magic?? ?